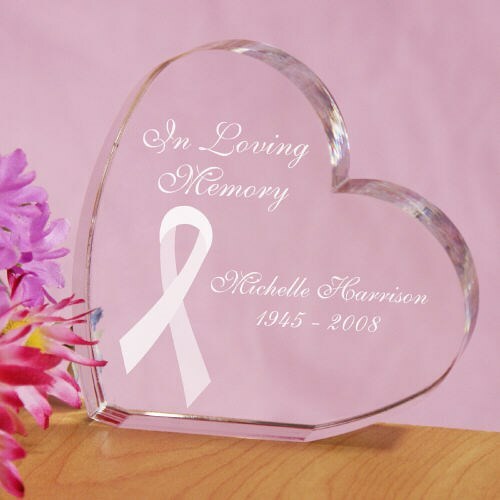 Our Personalized Memorial Heart Keepsake is a loving tribute to a special friend or family member who tried their very best in their personal battle against Breast Cancer. Although they are now at rest, remember that they are always in your heart and ready to support you when you need a helping hand. Our Engraved Memorial Heart Keepsake is available on our crystal clear, heart shaped keepsake. Each Engraved Heart Keepsake measures 3 3/4" h x 4 1/8" w. Includes FREE Personalization. Personalized your Breast Cancer Awareness Memorial Heart Keepsake with any name and dates. Additional Info MyWalkGear.com has many additional Personalized Breast Cancer Awareness Gifts for your special gift giving needs. Each time a gift is purchased from our Breast Cancer Awareness line of personalized gifts, MyWalkGear.com will make a donation of 15% of the purchase price to help in the fight against breast cancer.